Peterborough Panthers captain Ulrich Ostergaard has received a glowing endorsement from one of the club’s all-time greats ahead of his testimonial today (March 13). The Danish racer is rewarded for more than a decade of fine service to British speedway with his ’10 Year Spectacular’ at the East of England Showground (2pm). Ostergaard has attracted a high-class field for the season-opening event with three of his fellow Panthers title-winners from 10 years ago in the line-up. Hans Andersen, Niels Kristian Iversen and Piotr Swiderski return from that team which snatched the Elite League title in unforgettable fashion in 2006 while there are a host of other top riders on show. Andersen, said: “Ulrich deserves a day like this. He has been a great servant to Peterborough and British speedway over the years, and he is still an outstanding rider in the Premier League. “The standard of riders in the meeting show how popular Ulrich is in the sport. “That’s one of the reasons why I’ve been desperate to get him into the same Danish club as me, and I’m looking forward to riding with him this year. “I’m also excited to be part of his testimonial and it is great to have a chance to race at the Showground again. Danish legend Hans Nielsen, the winner of 22 world titles during his sparkling career in the 1980s and 1990s is a star guest at the ’10 Year Spectacular’. 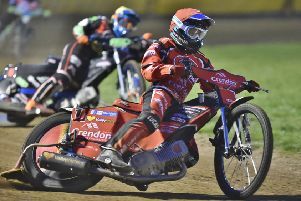 He will complete some demonstration laps along with Sky Sports expert Chris Louis and former Panthers favourite Olly Allen, who retired after a bad injury while riding for the club last season. Ostergaard was one of two Panthers riders in action last night. He scored seven points from his four rides to narrowly miss out on the semi-finals of the Ben Fund Bonanza at King’s Lynn. Clubmate Emil Grondal had to settle for two points in a meeting won by Great Britain international Craig Cook. ’10 Year Spectacular’ line-up: Hans Andersen, Niels Kristian Iversen, Kenneth Bjerre, Mads Korneliussen, Krzysztof Buczkowski, Piotr Swiderski, Danny King, Rory Schlein, Kenneth Hansen, Anders Thomsen, Ulrich Ostergaard, Nikolaj Busk Jakobsen, Nicklas Porsing, Michael Palm Toft, Simon Lambert, Emil Grondal. Also featuring: Chris Harris, Olly Allen, Chris Louis, Tom Perry, Danny Phillips, Tobias Thomsen, Peter Karger and star guest Hans Nielsen.